Think control line airplanes are mere toys on a string? You might want to re-think that... I mean really, do you have what it takes to hold on to a string with a hunk of metal screaming 200 mph at the other end? Can you use your propeller to snip the streamer from your opponent's plane? How bout landing 0n a miniature Carrier-Deck like full scale fighters? Once you've seen these guys in action you'll definitely realize they're much more than a toy planes on a string! During the summer of 1940 a character by the name of Jim Walker busted onto the scene at the National Model Airplane meet in Chicago. He whipped out his U-Control Fireball in the midst of this free flight event. This was the first time the crowd had seen an airplane with an internal combustion engine flying on the end of a string! Jim patented his U-Control system and The American Junior Aircraft Company immediately began selling kits for the infamous A-J Fireball. The advertisements claimed that the plane could be ready for flight in less than six hours. The Fireball was a huge success sparking the beginning of a new era of model aviation. 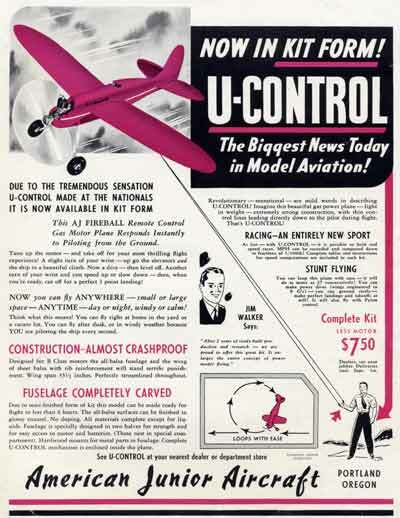 To the right is a full page ad from the 1940 September issue of Model Airplane News. This image was taken from American Junior Classics Website. By the way, thats an excellent website to visit if youre looking for a history lesson about model aviation. Jim was quite an extraordinary guy! How do control line airplanes work? The lines on a control line airplane serve two purposes. This first and obvious purpose is to confine the airplanes flight path to a radius or hemisphere around the pilot. The second function is to control the movement of the control surfaces, more specifically the elevator. Most control line systems have two lines which are connected to opposite sides of a control handle. When the pilot rotates his wrist, one line is retracted while the other is extended. The lines are connected to a bell-crank which in turn controls the elevator via a push rod. A third line is often used to control the carburetor of the engine. The FAI holds international contests for all areas of aviation. Section F2 of the FAI defines the rules for international competition of control line airplanes. The subdivisions of FAI F2 include F2A Speed, F2B Precision Aerobatics, F2C Team Racing, and F2D Combat..
Control Line Airplanes Built for Speed! Can you ]imagine hanging on to the other end of the line attached to an airplane going over 200 mph? Thats what happens when you get a hold of a FAI F2A control line model that is purely built for speed! Most control line speed models are really weird looking contraptions that really dont much look like an airplane at all. They have one really long and narrow wing in order to minimize the drag of the control line itself. Another way to reduce drag on control line airplanes is the use of only one control line instead of the conventional two lines. The control surface is manipulated by twisting this single line. 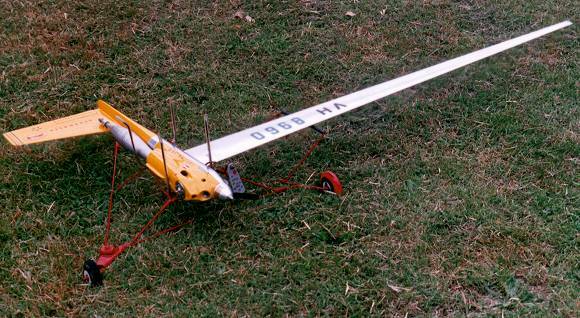 These type of speed models typically don't have any landing gear. They are attached to a frame with a set of wheels called a dolly for take off. When the airplanes gains enough speed it lifts up off of the dolly. You can see a picture of a control line speed model on its dolly in the picture above taken from Australian Control Line Nostalgia. During competition, the control handles are normally tethered to a stationary pole or pylon at the very center of the flying circle. This is to prevent the pilot from cheating by helping the model along by whipping their arm. Precision aerobatic or stunt competitions for control line airplanes is conducted in a similar manner as RC pattern competitions. Each pilot performs a set of maneuvers and their performance is scored by a set of judges. Stunt control line airplanes tend to be fairly large with wingspans up reaching up to 5 feet. They can be powered an IC engine or electric motor. Control line airplanes designed for aerobatic competition most always have a set of flaps that act in the opposite direction of the elevator. This gives the pilot much more authority over the pitch of the aircraft while performing the various maneuvers. You'll also find that pilots tend to put an extraordinary amount of effort into to the covering and appearance of their stunt planes. Since judging is sometimes subjective, they feel that a nice looking plane may help their flight scores. As you can see in AMA competition rules, a score is actually given for the appearance of the airplane! F2C racing is a race from start to finish with the goal being to complete a set number of laps before the opponent. Its much like a NASCAR race with passing, pit stops and the whole nine yards! It can get quite interesting with two pilots battling it out in the center circle lap after lap. Trying to maneuver their plane to victory while not stepping on one another or getting their lines tangled can be tricky! When the fuel runs out it's amazing how quickly the pit crew guy can catch the plane, refuel it, start the engine, and make adjustments. They really do give the NASCAR guys a run for the money thats for sure. There are several classes of control line racing. The Rat Race class is the fastest and can be very physically demanding. Then there is Slow Rat Race with profile type planes. The Mouse Race is for the small control line airplanes. Theres even 1/2A Scale racing where the models have to be a profile type scale rendition of an actual Goodyear Racer or Formula I Racer. A ribbon is attached to the back of each plane. The objective is to cut the ribbon off the opponents plane with the propeller of your plane. The plane who scores the most cuts wins the contest. Most combat planes are flying wings with .25 size engines. They're built with very cheap foam or balsa wood for obvious reasons. 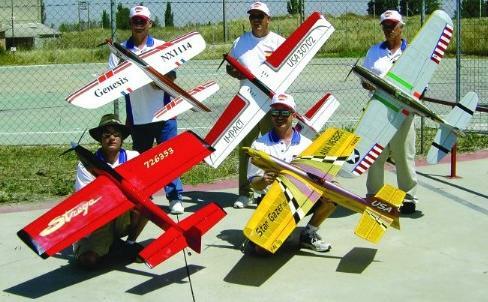 It's not uncommon to bring a half dozen or more planes to a single contest! In my opinion, this is the coolest of all the control line competitions. The idea came about by a bunch of Navy guys back in the 50s. Each plane is a miniature version of actual carrier aircraft and must land and take off from a miniature aircraft carrier with arrestor lines! Not only must the airplane land and take off from the carrier, it must be able to fly both fast and slow. The pilot is first scored on how quickly the aircraft can complete the first 7 laps. Its all about speed! The pilot will then signal the judges when he is ready to begin his 7 slow flight laps. The pilot utilizes flaps and throttle (additional control lines) to fly the plane as slowly as possible without the nose exceeding a 60 degree angle. The score for the low speed portion of the contest is determined by dividing the average high speed by the average low speed then multiplying by 10. Then comes the fun part, landing on the carrier deck! The carrier deck is complete with a series of arrestor lines which are supported by sandbags. The aircraft much snag one of the arrestor lines with its arresting hook. Points are deducted if the landing is anything other than a perfect 3-point landing.